More than 440 people recently attended the 40th Annnual UNC Lineberger Scientific Symposium, which featured talks on treatments and ongoing research that target the RAS-RAF-MEK-ERK and other signaling pathways in cancer. 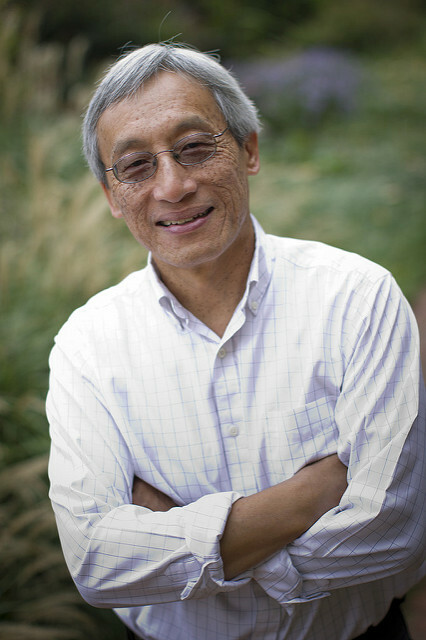 Channing Der, PhD, is a UNC Lineberger member and Kenan Distinguished Professor in the Department of Pharmacology at UNC-Chapel Hill. Researchers from around the country convened in Chapel Hill April 11-12 for UNC Lineberger’s Scientific Symposium to hear the latest research into molecularly targeted treatments for cancer. More than 440 people attended the symposium, the 40th annual, at The William and Ida Friday Center for Continuing Education. Called “Molecularly Targeted Cancer Therapies from Bench to Bedside,” the symposium featured the leading cancer experts whose reseach focused on treatments and ongoing research that target the RAS-RAF-MEK-ERK and other signaling pathways in cancer. There were talks on topics ranging from genetically engineered models of cancer, current efforts to develop protein kinase-targeted therapies, and the development of resistance to targeted therapies. Karen Cichowski, PhD, an associate professor of medicine at Brigham and Women’s Hospital, said the goal of her work is to identify and capitalize on different cancer cell vulnerabilities to develop rational combination therapies for RAS-driven tumors. RAS has not proven to be targetable, she said, so in the meantime, researchers are trying to use insight into signaling pathways downstream of RAS to develop combination treatments. “We want to … identify additional vulnerabilities that might offer targets for new combination therapies,” Cichowski said. “The take-home message here is you need at least one RAS effector pathway targeted in any successful (strategy) moving forward, but the unexpected finding is that different effectors may exhibit different effects,” she added. Der spoke about research in his lab to identify genetic drivers of resistance to inhibitors of ERK. ERK is part of the downstream signaling pathway activated by RAS mutations. Der said his lab has identified cell lines resistant to ERK inhibitors, so they used a loss-of-function genetic screen to identify drivers of resistance to the drugs. Through their studies, they found that loss of a particular gene function enhances sensitivity of RAS-mutant cancer lines to a particular drug compound. In closing remarks at the symposium, Der said that dogma in cancer research is a moving target, with things researchers thought they understood “not so clear anymore.” But he said scientists have many new tools and technologies at their disposal.